Today, Atlanta is often identified with its major air transportation hub and automobile-oriented culture. This association is only fitting, since antebellum Atlanta quickly grew from a frontier outpost to a bustling city largely due to the rise of transportation. From old Indian trails to ferries to railroads, Atlanta's early history is intertwined with the movement of people and goods. Atlanta's economy and its youth--it was founded in 1837--made it vastly different from the plantation South and older eastern seaboard cities like Savannah and Charleston. Instead of a planter aristocracy, the leaders of pre-Civil War Atlanta were more likely to be merchants or railroad men. The original inhabitants of the north Georgia locale that would one day become the Atlanta metropolitan area were the Cherokee and Creek nations, with the Chattahoochee River separating the two. Despite treaties and other official policies prohibiting white encroachment, white settlers moved into the region. In 1830 the United States Congress passed the Indian Removal Act, which called for the relocation of all southeastern Indians to western territories. The Cherokee Nation contested the act in court, but the discovery of gold on Cherokee lands near Dahlonega in 1832 brought an influx of white squatters and gold hunters, and the state of Georgia illegally surveyed and parceled out the Indian lands. In 1838 General Winfield Scott and his troops rounded up the Indians and began the forced march west to Arkansas and Oklahoma. Some 18,000 Indians were forced to leave their homes and lands in Georgia on a journey known as the "Trail of Tears." Almost 4,000 died en route. The lands they formerly occupied were opened to white development, but evidence of the first inhabitants abounds in geographic names still used today: Chattahoochee and Oconee from the Creeks, and Kennesaw, Tallulah, and Dahlonega from the Cherokees. In 1837 the Western and Atlantic Railroad, a state-sponsored project, established a town at the termination point for the railroad, calling that location "Terminus." You can see that railroad's historic Western and Atlantic Railroad Zero Milepost just north of Underground Atlanta, a shopping and entertainment area. In 1843 the town was named Marthasville in honor of the daughter of former Governor Wilson Lumpkin, who had been instrumental in bringing railroads to the area. Two years later, the town was incorporated as Atlanta. The origin of this name is the subject of some debate, with some people saying that it is the feminine version of the "Atlantic" part of the railroad's name, while others believe it is a variation of Martha Lumpkin's middle name, Atalanta. Some cities in the metropolitan area were founded earlier than Atlanta: Lawrenceville (1821), Decatur (1823), and Fayetteville (1827). Because of the Chattahoochee River, some of the earliest businesses in Atlanta were ferries and mills. The road named after Hardy Pace's ferry--Paces Ferry--winds its way in front of the governor's mansion and other prestigious addresses in the upscale Buckhead section of Atlanta. The site of James Power's ferry, and the road named after it (Powers Ferry), is now the location of numerous office parks and apartment complexes. Some of these ferry services survived well into the 20th century. Antebellum gristmills and sawmills also left behind traces through such names as Moores Mill Road and Howell Mill Road. Railroads, however, were the key to Atlanta's rapid growth. In 1836, only 35 families occupied the area. The population expanded to 2,572 residents by 1850. At the beginning of the Civil War, Atlanta, with a population of more than 9,000, was the connecting point for several rail lines, including the Georgia Railroad from Augusta, Georgia; the Macon and Western, from Macon, Georgia; the Atlanta and West Point to West Point, Georgia; and the original railroad that created Atlanta, the Western and Atlantic to Chattanooga, Tennessee. Railroad-related industries thrived, including the Atlanta Rolling Mill, the second largest manufacturer of railroad tracks in the Southeast. These businesses and railroads centered on the area that Underground Atlanta occupies today. 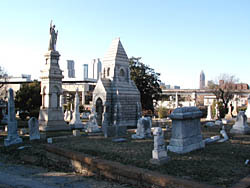 Another antebellum landmark is Oakland Cemetery, Atlanta's first municipal cemetery, established in 1850. 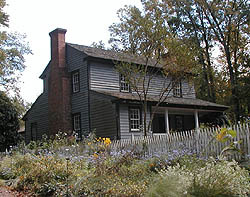 If you are looking for an antebellum Georgia plantation, Tullie Smith Farm at the Atlanta History Center on West Paces Ferry Road demonstrates how some north Georgia farmers lived and worked. This plantation-plain-style house was built just outside the present-day city by the Robert Smith family in the 1840s. Smith was a yeoman farmer who owned 11 slaves and cultivated about two hundred acres in DeKalb County. Hogs and cattle ranged freely on the other 600 acres. Despite popular belief to the contrary, the large, extravagant plantations of Hollywood and romantic novels were more the exception than the rule in the Upper Piedmont portion of the South. Tullie Smith Farm consists of a farmhouse, a separate open-hearth kitchen, vegetable, herb, and flower gardens, a blacksmith shop, a smokehouse, and a barn complete with animals. Living history interpreters lead tours and demonstrate the crafts and everyday activities. While some enslaved persons in antebellum Atlanta were agricultural laborers, most worked as general laborers and domestic servants or else pursued skilled trades as brickmasons, carpenters, and blacksmiths. Many of these slaves were hired out and sometimes were allowed to keep a portion of their wages. These men and women often went about their daily lives with little or no interference from their owners, but the city passed numerous ordinances restricting their movement and assigned much harsher penalties for slaves and free blacks found guilty of infractions than whites guilty of the same offense. While at the Atlanta History Center, visit the permanent exhibition Metropolitan Frontiers. This exhibition presents the story of Atlanta, from the original Indian inhabitants through its emergence as a major transportation and global communications hub, told through photographs, rare artifacts, and video and audio clips. Essay by Andy Ambrose, Karen Leathem and Charles Smith of the Atlanta History Center. 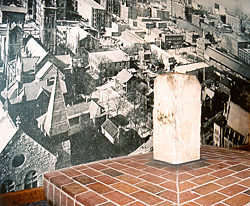 For more on Atlanta's history, see: Andy Ambrose, Atlanta: An Illustrated History. Athens, Ga.: Hill Street Press, 2003.